St Paul's Church is a brick, colonial-style building erected in 1739 and originally called Borough Church, but reconsecrated as St Paul's Episcopal Church in 1832. Although it has been remodelled a number of times, it retains its historic character, including unusual box pews. The church is famous locally for a cannonball that is lodged in the north-east corner of the building, fired on instructions of Lord Dunmore on 1 January 1776. In its history, the church has had a number of organs. It is believed that the first, modest, instrument was installed in the west gallery but we do not have any details of this instrument. A larger organ was installed behind the altar early in the twentieth century. Later, it was thoroughly remodelled and moved to the north gallery. Parts of this instrument may have been utilised in a new instrument which was installed in a chamber to the north of the chancel. When that instrument became so deteriorated that repair was no longer viable, the search was started to replace it. The position of the old organ in the chamber was most disadvantageous. The sound did not get into the body of the church properly, and the instrument was all but useless in leading congregational singing. The most favourable position for a new organ was clearly the west gallery but, as that was used for the congregation, there was some initial resistance to the idea, so the transept galleries were investigated as well. However, it was clear that the space available in the transept galleries was too limiting for an organ, so ultimately the west gallery position was decided, and all the builders who tendered for the work suggested this position for the new organ. It was also decided that the choir would migrate to the gallery as well, and by asking the choir to sing in the gallery whilst the position of the organ was being discussed, the advantages of this location were appreciated by all. As is so often the case, initial resistance to a fairly radical change to the liturgical layout dissolved once the organ and choir were established in the gallery. Whilst undoubtedly the best position for the organ and choir, the west gallery did present some problems. Firstly, it was fairly deeply raked and, secondly, there was a limited amount of height available. Fortunately, it proved possible to remove some of the steps towards the rear of the gallery but, even so, there was only 4.8m available at the front of the organ, and even less towards the rear. However, as the organist wanted a low, detached console so that he could direct his choir more easily, it was possible to lower the impost considerably without compromising the overall design too much. All the roller-boards were mounted horizontally to save height, and it just proved possible to dispose the manual divisions vertically. 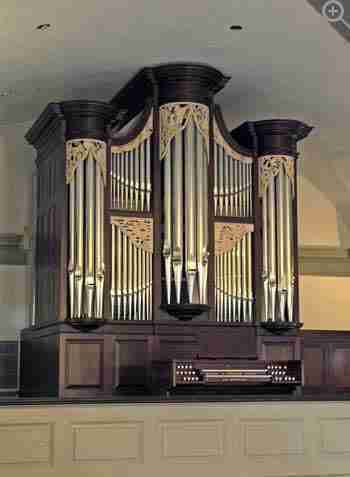 Opinions are varied as to the relative advantages of placing the Swell Organ above or behind the Great Organ. We still believe that the vertical disposition has most advantages, and a horizontal disposition would not have been possible in this instance. For both visual and tonal reasons, the independent Pedal Organ stops were placed outside and behind the casework, allowing for a shallower case than would otherwise have been needed. To save space, three of the Pedal Organ stops are borrowed mechanically from the Great Organ: the Principal 8, Bass Flute 8 and the Trumpet 8. As previously, the bass of the Pedal Principal 8 is winded more generously than the Open Diapason 8 from which it is borrowed. The design of the case was influenced by general styles of 18th century English case design, as it was felt this would be most appropriate for a church of this date and may represent what might have been built when the church was originally constructed. It is finished in stained and polished mahogany. 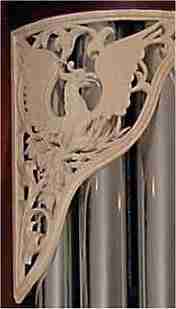 When the carving is designed, we usually try to incorporate elements relating to the church and its history. In this instance a number of possibilities were discussed which led to some unique results. The carving on the bass tower depicts the original 18th century chalice and platter presented to the Borough Church (St Paul's). Their inclusion signifies the Eucharistic tradition of Episcopal worship. Made in London, the chalice and platter are now displayed at Norfolk's Chrysler Museum of Art. On the treble tower is the state butterfly, a tiger swallowtail (also representing resurrection) and the state bird (a cardinal). Both these are backed with dogwood foliage and flowers which are the state tree and also a symbol of the passion of Christ. The centre tower has a phoenix, representing the rebuilding of the church after the sacking of Norfolk by the British in 1776, on the left hand side, and a book with a sword on the right hand side for St Paul. The bass flat has three interlocking fish to represent the Trinity and Norfolk's association with the sea, and a scallop shell for baptism and pilgrimage. This year is the 400th anniversary of the first landing of ships from England in the bay of Norfolk, Virginia. This was the motivation for the carving on the treble flat which depicts the three ships of that first fleet and the coasts of Cornwall and Virginia, together with an anchor to remind us of the cross and salvation. The carving above the flats is of the tobacco plant, Virginia having a long historical association with tobacco growing. The organ was completed shortly before Christmas 2006 and received its first public demonstration in a traditional Festival of Carols service which was recorded for broadcast on the local radio station later the same day and again on Christmas day. It will also be used for various festivals in Norfolk including its annual Arts Festival. 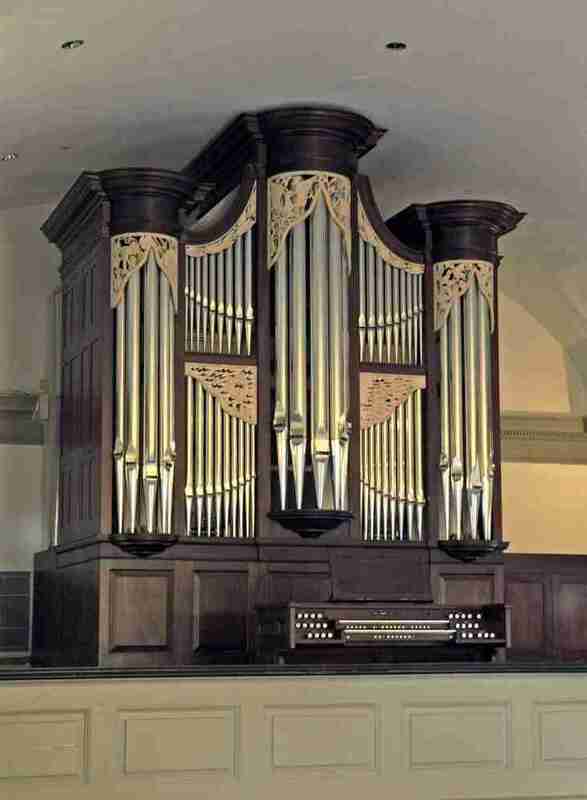 View the Specification of the organ of St Paul's Episcopal Church (completed 2006) and the pipe scales.